There are key points to know about planting bougainvillea but 1 in particular is very important. Here's how to plant bougainvillea so that it grows successfully. A little hummer enjoying my “Rainbow Gold”. 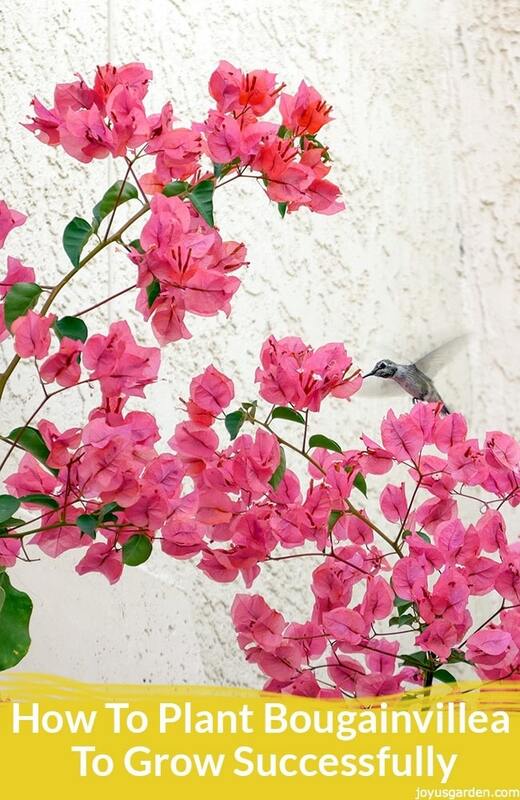 This is 1 of the reasons you want to successfully plant your bougainvillea – hummingbirds & butterflies love them! I’ve maintained many bougainvilleas, and I’ve planted many of them. Planting a bougainvillea isn’t too much different than planting any other shrub or vine except for 1 key factor. If you don’t do this 1 thing, it’s a crapshoot as to whether your bougainvillea will do well or even survive. This is all about how to plant bougainvillea to grow successfully. When I moved to California from New England back in the early 80’s, it opened up a whole new world to me in so many ways. I went to work 2 days a week at a highly esteemed nursery in Berkeley to learn about plants and gardening practices in that part of the world. And boy did I learn a lot! This is where I first discovered bougainvillea and found out about this 1 important thing to know which came directly from the grower. I have 4 bougainvilleas, which is plenty for me, and don’t actually plant one in either this post or video. You’ll get the most important points and can refer to how to plant a shrub successfully to actually see the steps to take. Of course prep is very important and that you’ll see in the shrub video. Another reason to plant your bougainvillea properly – the massive show of color you’ll get. First of all, make sure you’re planting it in a sunny, warm location. Bougainvillea needs sun & heat to thrive & be a blooming machine. Just like planting a shrub, dig the hole at least 2 times as wide as the rootball. Loosen the soil on the bottom of the hole to make sure the water will drain out. Bougainvillea doesn’t like to be kept sopping wet & is subject to rot. So, the soil needs to be well drained. A rich, loamy soil is ideal. You can amend as you need to in your area. I always amend in the ratio of 1/3 local organic compost to 2/3 native soil when planting bougainvillea. I always keep a 2-3″ layer of compost on top for good measure. When planting in containers, use a good organic potting soil. Mix in compost at a ratio of 1/4 as the potting soil should already have compost in it. I always top my container planting with a 1-2″ layer of the compost, again for extra good measure. Just know that you’ll probably have to water your bougainvilleas in containers more than you would if they’re in the ground. Also, the shorter growing varieties are much better suited to growing in containers. 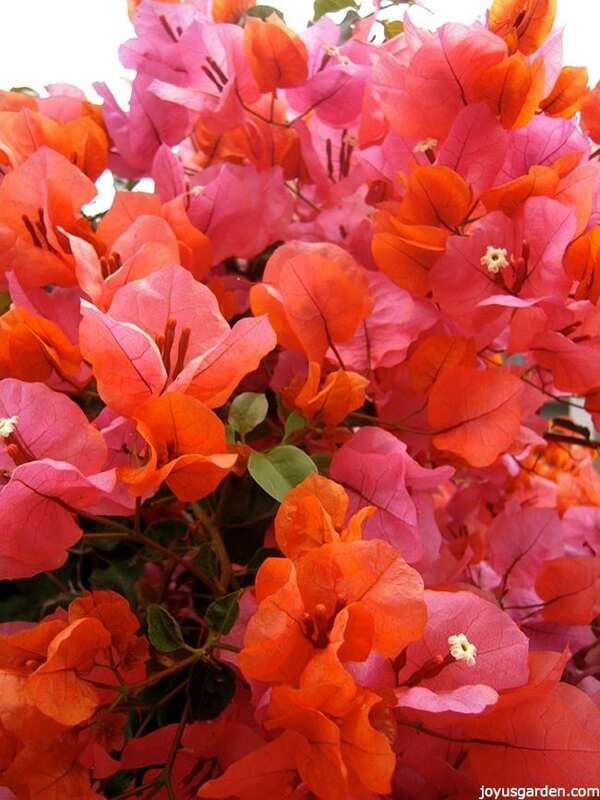 Speaking of watering, bougainvillea prefers infrequent, deep waterings rather than frequent shallow waterings. Too much water = too much green growth & eventually rot. When your bougainvillea is establishing, you’ll have to water it more frequently. How often depends on the size of the plant, the soil its in & your climate zone. Spring or summer is a great time to plant your bougainvillea because that gives it plenty of time to settle in before winter comes. If you have an unusual cold snap, a newly planted bougainvillea (say in late fall) is much more likely to get hit &/or not recover. Choose the location carefully because bougainvillea doesn’t like to be transplanted. That’s a crap shoot also. You’ll see why after below. 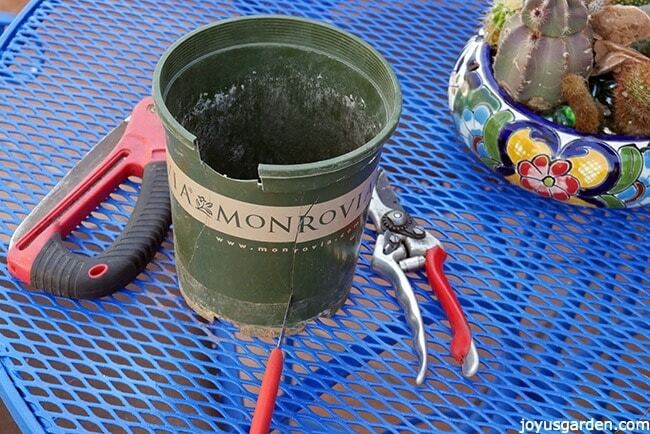 I used a sharp florist knife to demo the slitting of the grow pot. You can also use your pruners or saw. Either way, just be very careful not to cut too deeply into the root ball. Bougainvillea can take full sun & heat without skipping a beat. However, it’s a big baby when it comes to the roots & doesn’t like to have them disturbed. For best planting results, be sure to leave your bougainvillea in the grow pot when planting it. Put a few slits in the side & bottom of the pot, being careful not to slash too deeply into the rootball. You’ll see me illustrating this in the video. This method allows the roots to grow out of the pot but also protects the rootball. You want the level of the soil of the rootball to be even with the level of the soil you’re planting it into. This means the rim of the grow pot might stick up a bit. I always cut it off as needed because I look the look much better. Whether you cut that off or not is up to you. It won’t hurt the plant at all but I never wanted to see a rim of plastic in the garden. Maybe you’ve planted one, taken it out of the pot, and it’s done just fine. As I said, it’s a crap shoot and one I’m not willing to take. I just wanted to share with you this 1 important thing to know when planting bougainvillea. After all, I want your bougainvillea to grow, thrive and flower like crazy! I need help with my attempt at these lovely plants. I have bought several and I have one thrived and grew huge, it didn’t bloom as much, but I had it in the front yard and I used to call it “the Whomping Willow” as people got attack by it as they past it up. LOL This past winter I trimmed it down, as a guy at a nursery said I could do. It hasn’t come back. ;-O The branches are still very firm and hard. Should I just leave it alone? HELP!! thank you so much for this as I just bought one today. something prevented me from planting her today, and I’m so glad.. now I know I will keep her in the pot. Thank you for all this valuable information Nell ,I will give my bougainvillea from cuttings a good home in Iquitos Peru [the middle of the Amazon jungle ].I am going to see what deep purple and brilliant orange bougainvillea do kind of interwoven together.I will take a picture and send it to you . I live in London UK. I have had a bourganvilla in a pot now for about five years. I have tried to bonsai it. It seems to be thriving and is at the moment covered with gorgeous bright pink blooms. It is January!! Is this unusual? I would love to have some response to my query and also some tips on how to keep it going. It is kept indoors on my window sill. I planted two boganvelia shrubs and made the big mistake of watering them too much for the first 5 months then when I learned; I stopped watering them. They get 7 hours of sun everyday; they mostly look dead but it did bloom a month ago but only for a couple if weeks only at the ends of the branches. How do I know for sure if the plant is dead? Would pruning it way back help? They are not big plants. HI Nell.. i am in Delhi, India. plz advice how big should be my plastic pot to grow bougainvillea to cover my 120 inch balcony iron grill. How should i plant it, and what should i take care for planting it good. What type of fertilizer? Mine was beautiful when I bought it, flowers fell off and haven’t had blooms since. Mine is a house plant in winter, and patio in summer. No direct sun in winter. I live in Northern California (santa rosa) in zone 9b. I was excited when I read that bougs are hardy in zones 9b-11. However, after reading more online, it seems that bougs can’t handle freezing temps. We do get some freezing nights in the winter, but it’s usually just a quick snap of an hour, rarely 2-3 hours. I’m confused as to why it would say they’re hardy for my zone if my zone freezes and they don’t like that!?! I’ve just purchased and planted a gorgeous bougy (full sun for 6-7+ hrs/day) but now I’m afraid it won’t make it through next winter. Thank you for the wonderful on your website. I am fascinated by these flowers and I would love to see my newly bought boug flourish just like those from proper climates such as Greece. I live in zone 7a, so I would not leave it out. It will be kept on a very sunny closed balcony, in a ceramic container. I bought a Vera deep purple 4 days ago but to my despair it is constantly shedding its beautiful flowers. The soil was soaking wet when I got it. Could overwatering be the problem? Recently planted (2 )15 gallon and (3) 3 gallon bougainvillea on a trellis against my garage. They get full sun and growing nicely. My questions are 1). How do I know when they are established? I planted them 2 weeks ago. 2). I know you don’t fertilizer your bougainvillea but should i be fertilizing mine while they are being established? 3). When should I give them their first pruning? Sorry to ask so many questions but I would really like to keep them healthy and beautiful and I’m a little lost. Love your posts as they are so helpful to a beginner gardener like myself! I live in Hong Kong where the climate is sub-tropical and can be very hot and humid during the summer. I bought a bougainvillea two weeks ago to put on my rooftop. I didn’t read your post when I planted it, so I cut the grow pot and took the plant out, and planted it in a big ceramic container. Initially all the flowers fell off. I trimmed it after reading your post to encourage new growth. Luckily it seems to have settled in despite the trauma of being transplanted and I can see lots of new growth coming out in the last couple of days. It is now growing in a sunny part of the roof and I hope to see some new flowers soon. However, Hong Kong can get quite a lot of rain and humidity, so I am just wondering how best to care for it in these conditions? Hi Nell, I am so thankful I found this site. I just bought 2 small, beautiful bougainvilleas and found this before I planted them. I have killed 4 previously, about one a year. The last one, was watered too much, I’m sure because I planted it near my vegetable garden to make sure it was watered well, as I thought underwatering was what killed the other two, I lasted about 3 years, but it was barely a living stick with tiny leaves on it. Before I could transplant it again, it finally died. This time I am leaving them in the pot, and planting in a sunny location against the fence that borders my and my neighbor’s yards. Thanks again for your great advice. Hi Nell, I live in San Antonio TX. I have had a big for 4 yrs in a hanging pot. The few night a year it gets cold I being it inside. This Spring I had a beautiful bloom. As it has now turned to 100F my plant keeps wilting in the afternoon sun. It hasn’t done this in past summers. I am wondering if the roots are now too tight and near the edge of the hanging pot. Do I cut it out and repot? Please advise. Thanks! My husband brought two hanging baskets home for me today. I had NO CLUE what they were! Some research led me to you. We live mid Missouri, zone 5. Wish me luck! If they live through summer, I am going to take them in for the winter. What makes them so striking to me (besides the stunning bright pink blooms) are that they are so wild and lanky! Thanks again on the education! I have a question about my bougainvillea. I live in Ohio and I brought my 3 pots inside last winter before the nights got too cold. I stored them in my garage all winter and didn’t prune them. I am ready to prune them and put them outside on my patio but I am not sure if they are still alive. Since I didn’t prune them and just brought them inside for the winter, I didn’t touch them all winter. The leaves are still on them but they are wilted and droopy. There are no new leaves or flowers and no new growth. I probably should have watered them. Can they recover? Please help! What can I plan in the same extra large planter with my bougainvillea? I had Lavender but it wasn’t being managed well and I believe was “chocking” the life out of the bougainvillea, so I moved the lavender to another planter. Would gardenias be ok to plant in the same planter? It’s a large rectangle planter with the bougainvillea at one end of the planter..
Just found your blog after buying a California Gold Bougainvillea! I am extremely new to gardening and would like to keep the little guy alive. I love the look of them trained into a sort of tree and would like to try it, but the spot I’d like to put it has really shallow soil, so I’m thinking I should keep it in a pot, but I’m worried about how sensitive they are and how it would eventually outgrow the pot. Is it possible to keep it healthy like that? Or will I just eventually need to repot it and end up killing it most likely? Thank you of all of this information, your blog is an incredible resource! Hi Nell, We just moved down to Florida from Boston and just had to buy a bougainvillea. My wife picked out a pale pink with a kind of long petals. We got it at Home Depot complete with trellis. I want to repot it into our bigger ceramic pot which has a drain hole. Okay to do? I am posting this again because I am not sure if you received it the first time (June 3, 2018). I have a question about my bougainvillea. I live in Ohio and I brought my 3 pots inside last winter before the nights got too cold. I stored them in my garage all winter and didn’t prune them. I am ready to prune them and put them outside on my patio but I am not sure if they are still alive. Since I didn’t prune them and brought them inside for the winter, I didn’t touch them all winter. The leaves are still on them but they are wilted and droopy. There are no new leaves or flowers and no new growth. I probably should have watered them. Can they recover? Please help!